I have a child who rarely smiles for the camera and doesn’t seem to appreciate a mom who wants to document everything (she’ll thank me when she’s older, right?). When bribed with something along the lines of cupcakes, I may have some luck, but I usually hear comments like “put your phone down!” and “Mommy, no pictures! Make art with me!” Sooo, when I snapped this picture at the end of a recent art moment, I thought to myself, “hey, we must have hit art project gold here!” In hindsight, I think she was wowed by the idea of camouflage (more on that later), but why not start a blog post with a smiling kid, right? Small pieces of tissue paper. I cut mine into little irregular rectangles, but any shape will do. 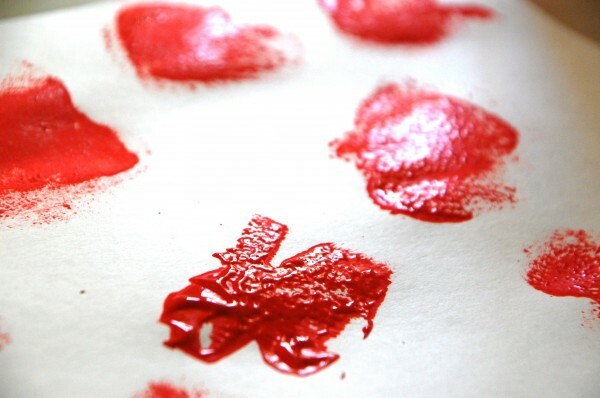 Ours is the “bleeding kind” from Discount School Supply, but if you’re scrounging around for materials for a project you’re doing RIGHT NOW!, see if you have any stashed away with your gift wrapping. 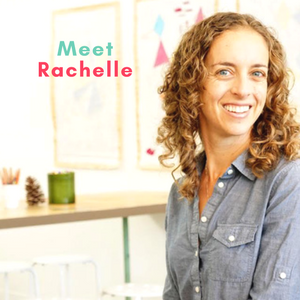 Basically, you want really thin paper that will easily soak into the glue. My daughter called this “booger paper,” presumably because we use tissues to wipe noses. So funny. 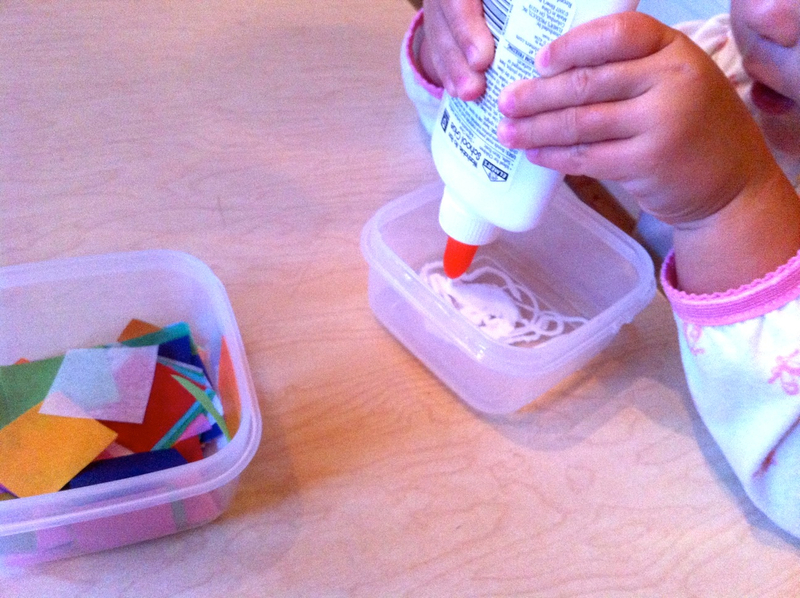 Mix a little bit of water with glue to make a paintable paste. Liquid starch will also do the trick. 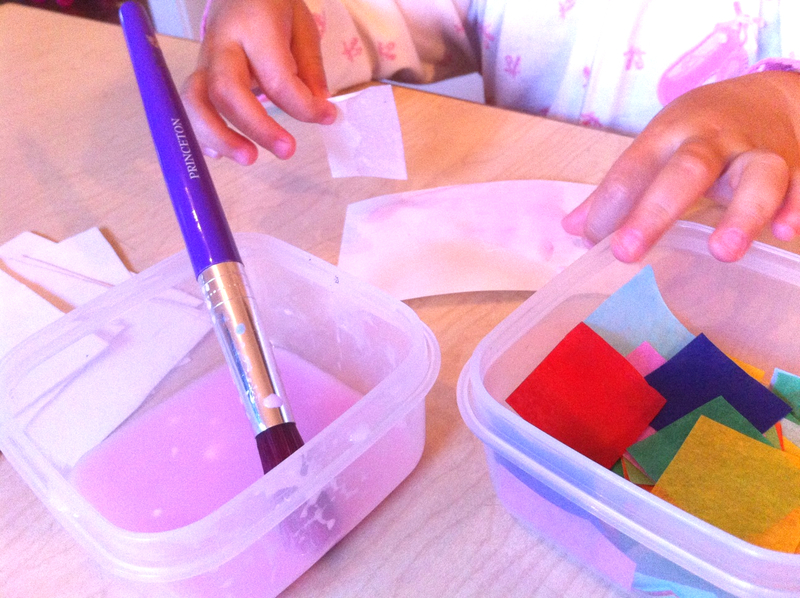 Paint some of the glue mixture on the paper, and then stick pieces of tissue paper on the glue. Encourage layering. The piece in the foreground is where I demonstrated the process, trying to keep it simple and not too prescriptive. 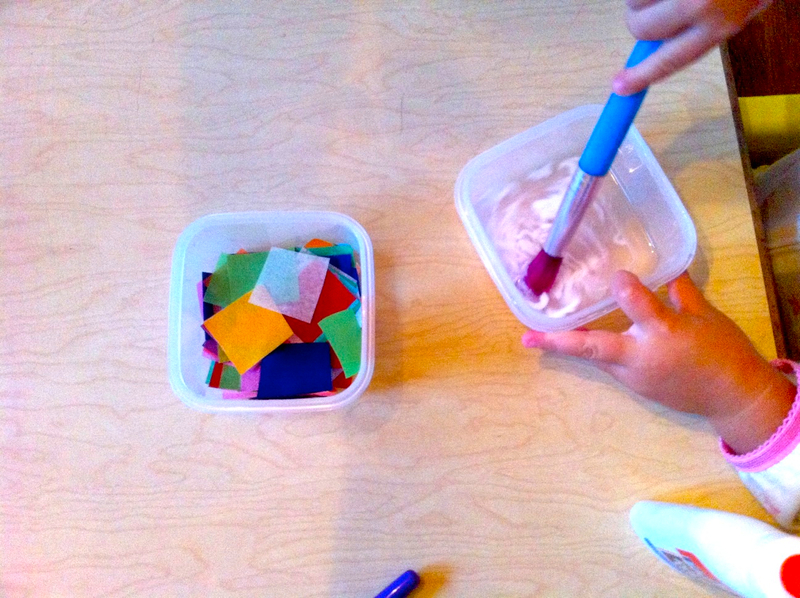 Selecting pieces of tissue — creative and critical thinking at work! And then we opened a factory. Surprisingly, this is what cracked her up. 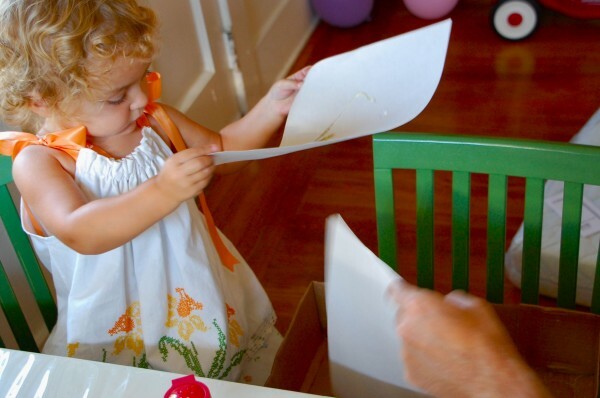 She glued a piece of white tissue to the paper, which of course disappeared. We talked about camouflage, and how we can’t see white paper when it’s glued to another sheet of white paper because they “match.” With Halloween around the corner, I placed an orange tissue paper on top of one of our pumpkins, to show that this phenomena occurs with colors other than white. And then the laughing started. So, in case you were wondering, camouflage is pretty funny in the mind of this 28 month old! In the days leading up to the arrival of Baby I, I spent a lot of time in our garage in search of baby clothes, the car seat, and other long forgotten baby paraphernalia– and along the way I found a box of sponges shaped like letters, hearts, and flowers that I’ve been hauling around since my early art teaching days. 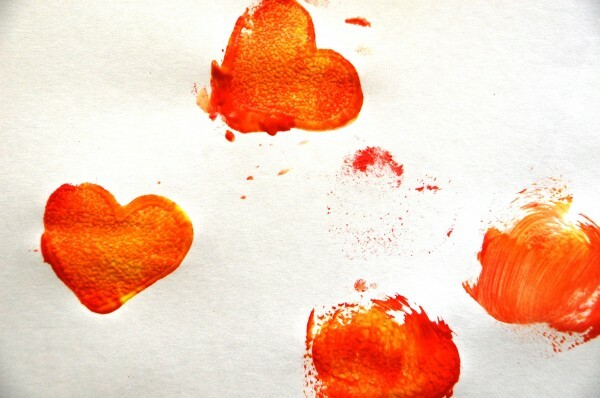 Inspired by my find (and, frankly, thrilled that I could finally justify keeping all this junk to my poor husband), I set up a bowl of red and yellow paint, put out some paper, and showed my toddler how to dip the sponges in paint before stamping them on the paper. 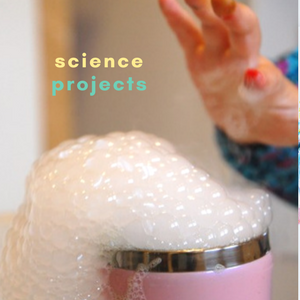 The project is incredibly simple, and managed to hold my child’s attention for almost, er, ten minutes. In giving her two warm colors I thought it would help her focus on how the sponges work with the paint, but in hindsight, having a few extra colors may have sustained her interest longer. All said, as a first sponge stamping experience I’m pretty pleased with how it all played out. 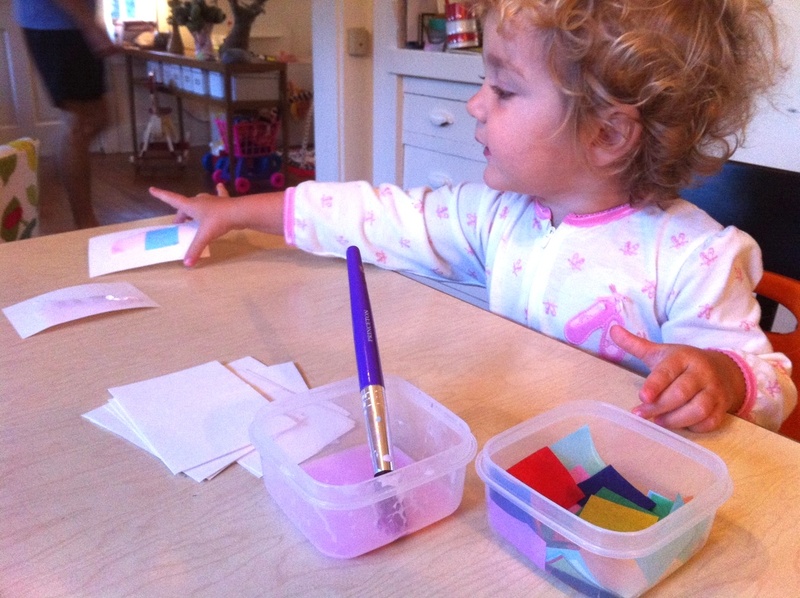 I showed N how to dip the sponge in the paint and both smear and stamp it on the paper. 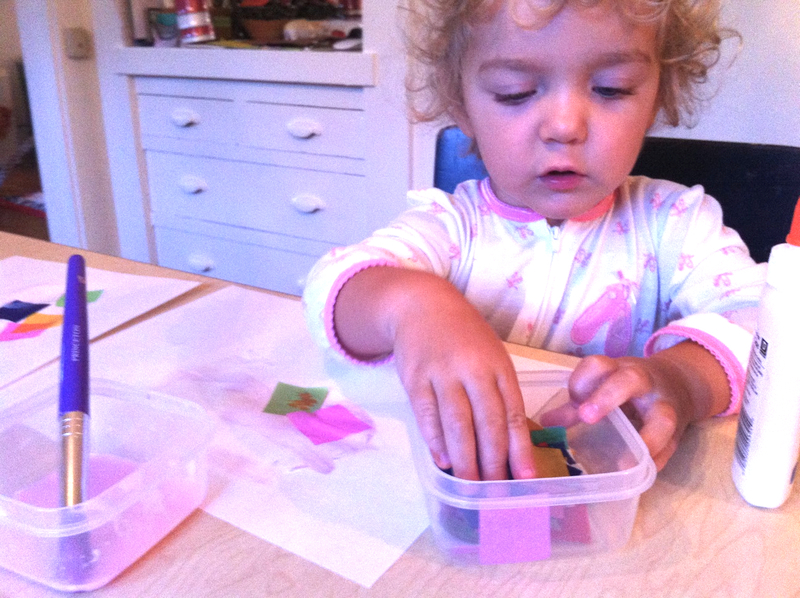 She opted for stamping. 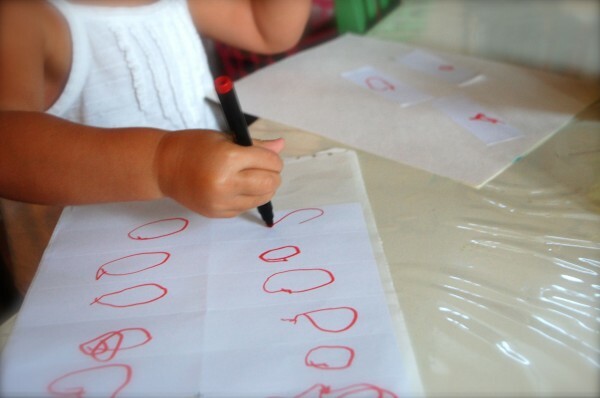 I always do my demonstrations on my own piece of paper to allow her the freedom to create her own work without my influence. I think I picked up these sponges at a dollar store, which might be a good place to forage for something similar. My neighbor Stephanie had us over for sponge stamping, and she used make-up wedges. What’s so great about these is that they’re dense like foam, and hold their shape nicely in the cluthes of little hands. Unless they’re refried and smothered in guacamole, my daughter is not a huge fan of eating beans. 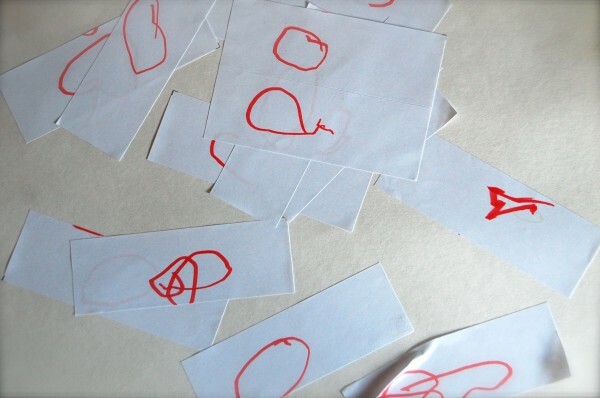 But, when given the opportunity to glue the little suckers to a piece of paper, the very same beans are her friends. After spending way too much time grazing the bulk bins on a recent trip to the market, we filled up a bag with a colorful potpourri of bean soup for art making, of course. 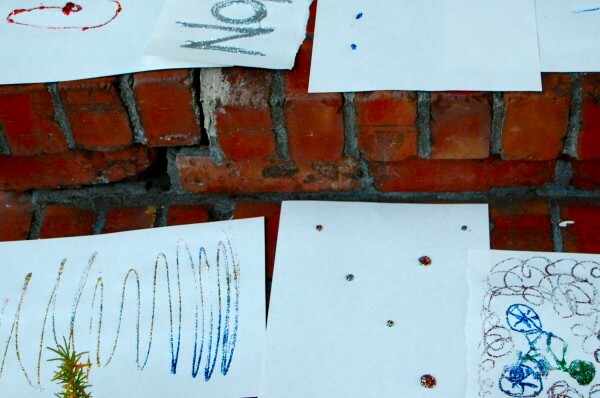 This simple little activity is a great way to extend gluing, glittering, and collaging activities. 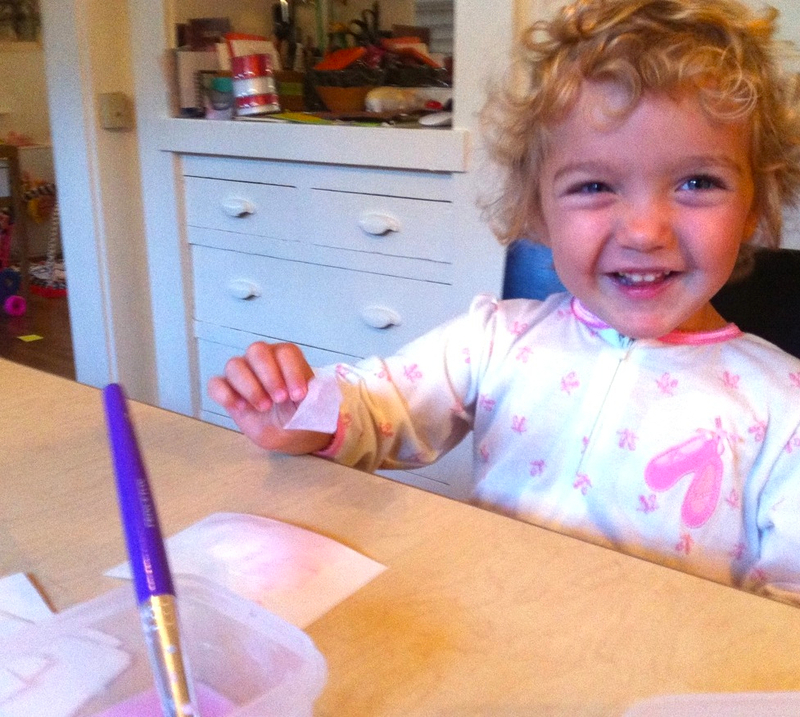 My kid adores glue, so this one was bound to please. 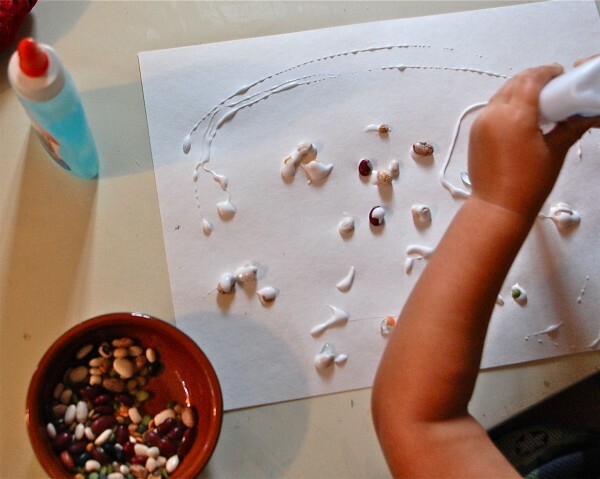 And for the last week, a bowl of beans has graced our art table for spontaneous moments of bean art. 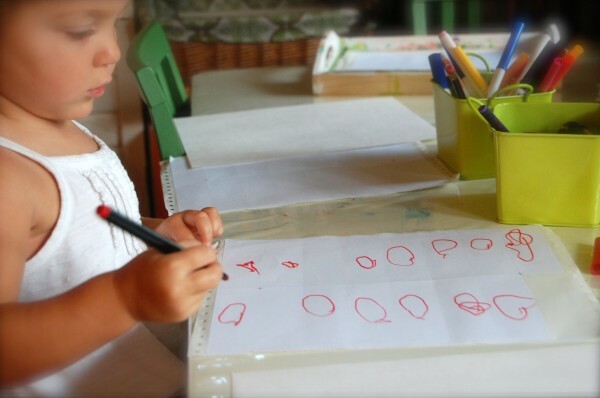 If gluing objects is a new activity for the child, demonstrate — on your own sheet of paper — how to squeeze the glue and drop beans in the glue puddles. Otherwise, let your child have at it. My daughter made two bean pictures the first day we made these. 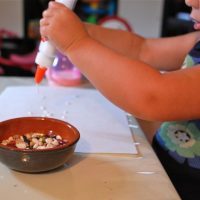 When I thought she was “done” with her second piece, I was surprised to watch her make the decision to coat each of her beans with another layer of glue “to make them disappear.” Very cool. 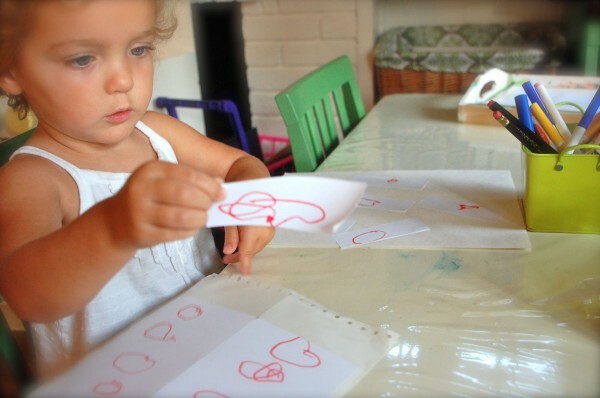 And then, a couple days later, I was was reminded of the importance of making creative activities and supplies accessible when she walked over to her table to make bean art just minutes after waking up. 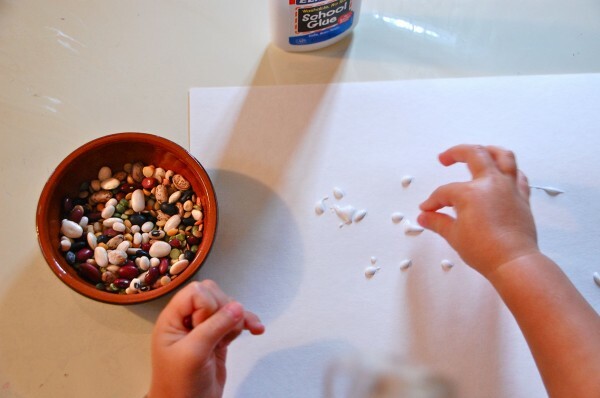 If you have older children, they may enjoy making a bean mosaic like this one from Frugal Family Fun Blog or this one from Disney’s Family Fun. And here’s an edible version, using jelly beans, which is definitely for the older crowd. My child would just spend the whole time eating, and none of the beans would make it into the art. Since last week’s Glitter-Fest 101, mounds of paper have been magically turned into sparkly creations — and my husband and sister have even jumped in on the glittering action. I actually overheard my husband say, “glitter is fun!” In all fairness, I think he was commenting to our 2-year old on how much he was enjoying their time together, but still! The only one who’s been overwhelmed by the glittering extravaganza has been my vacuum cleaner, who was recently given a raise for all of his hard work. 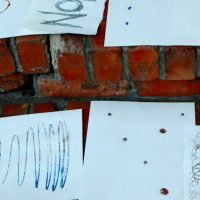 To foster the glittering fad, which (for my child) stems from a love for shaking sprinkles of any kind, I came across an idea for making my own glitter from salt. It’s not exactly the same as the wonderful shiny metallic stuff, but it fulfills the joy of shaking interest, it’s always fun to play with a new material, and I’m endlessly fascinated by the process of making our own art supplies. 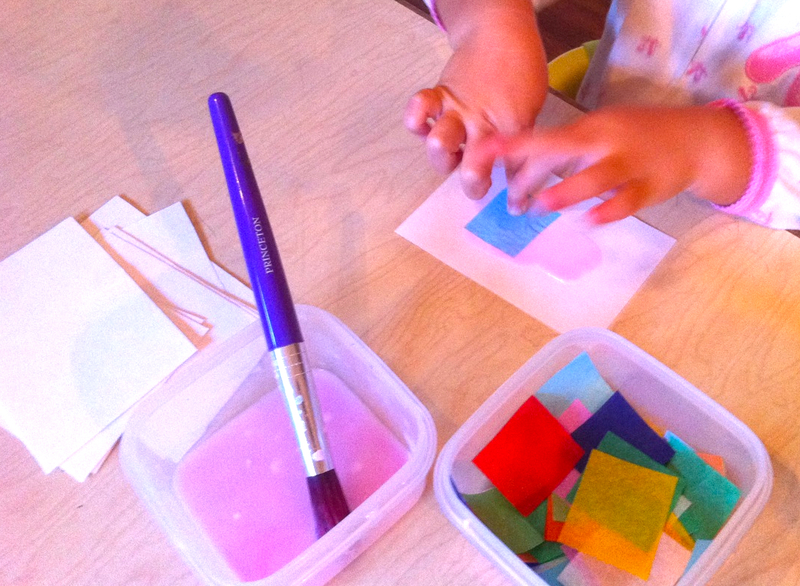 Kids will enjoy the process of making their own art material. 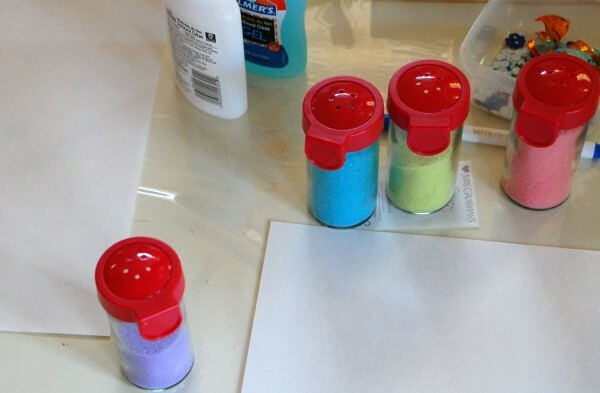 Making homemade art supplies can be fun, economical, and teaches children that art can be made from just about anything. I hear my daughter say “let’s buy it!” way too often, and it’s nice to think about future conversations that are infused with “let’s make it” instead. 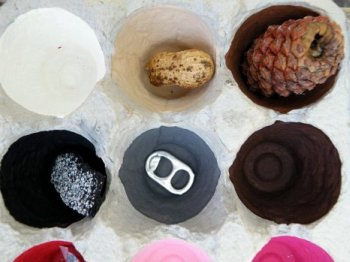 Playing with new materials opens children’s experiences and world views up to new possibilities. It’s easier to clean up than traditional shiny glitter. 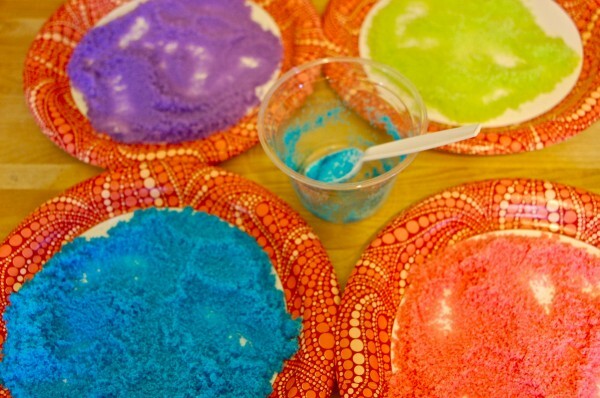 If you use the salt/food coloring recipe, it’s completely non-toxic. 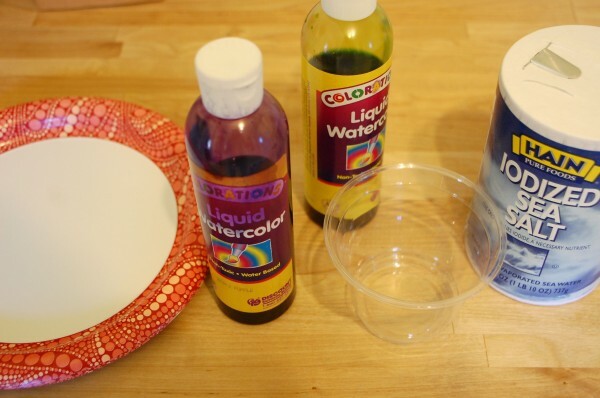 Food Coloring or liquid watercolors. 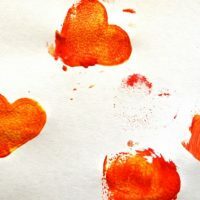 I used Colorations Liquid Watercolors because I had them on hand, but I hear that food coloring works well too…and many of us have some tucked away in our kitchens. If you’re considering the watercolors, I think they’re worth investing in for other projects too: they’re reasonably priced, washable, and the colors are rich. Shakers. I found some salt/pepper shakers in a dollar store. Cocoa and parmesan cheese shakers would do the trick too. Pour the desired amount of salt into the mixing bowl or cup. 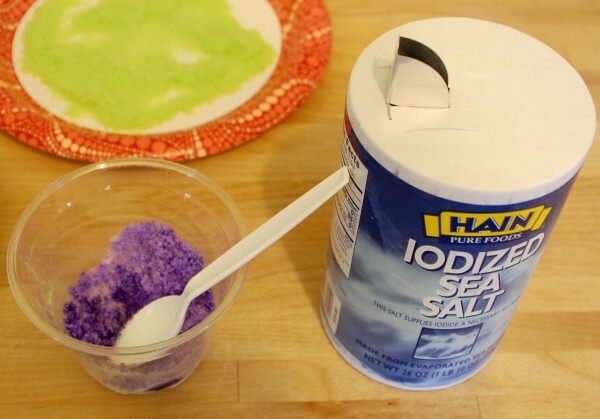 Add a few drops of food coloring/watercolor to the salt and mix until the salt is evenly covered. Pour the mixture onto a plate and allow it to dry. This should take a couple hours. If you want to expedite the process, pour the salt mixture onto a cookie sheet and bake for 10 minutes at 350 degrees. 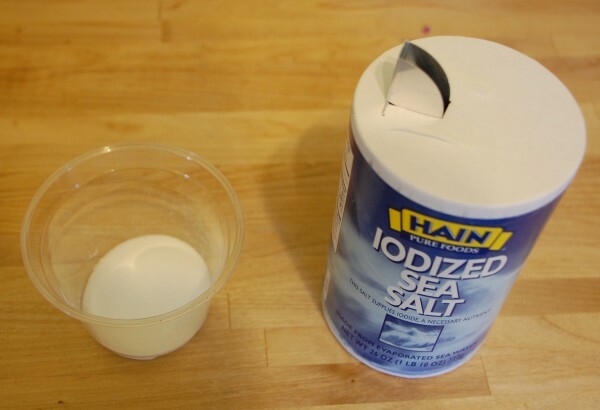 Once dry, break up the clumps of salt with your fingers or the back of a spoon. Pour glitter into your shakers. 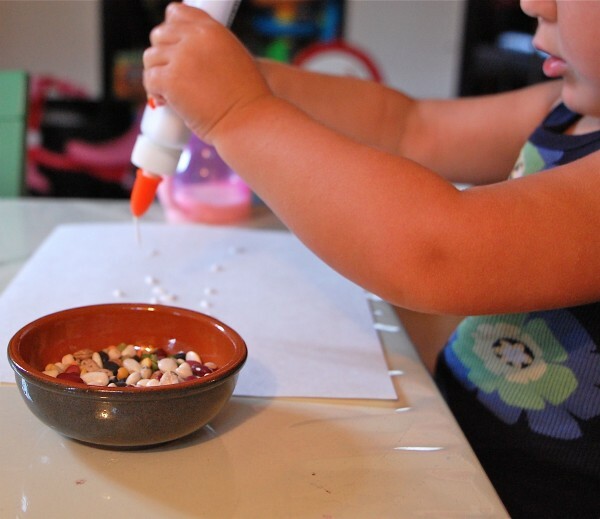 Another option is to pour into a bowl so that your little artists can scoop it onto their art with spoons. Enjoy your new, homemade glitter! If you grew up in the United States, there’s a good chance that during your childhood you made some version of an egg carton craft: think lady bugs with pom-pom faces and googly eyes. 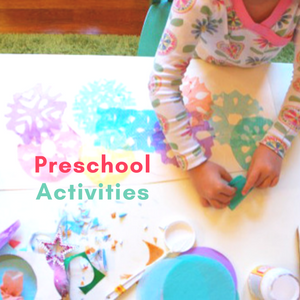 On this page alone, I counted 47 craft projects for preschoolers that begin with egg cartons! What N and I embarked on is more of a free-painting project, sans pom-poms, pipe cleaners, and googly eyes. 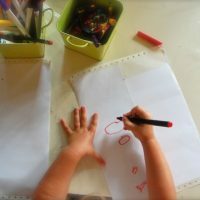 It takes the open-ended painting experience from the easel to the egg carton, and offers children an opportunity to think creatively and independently. 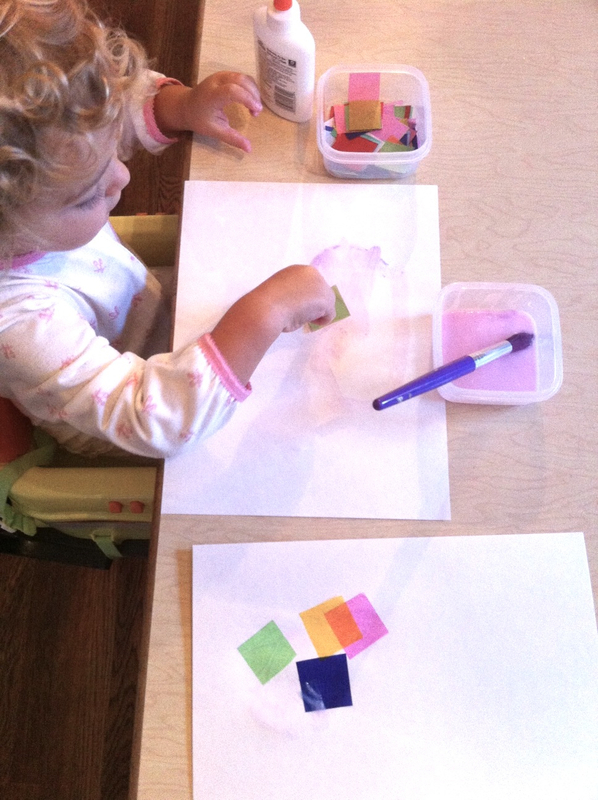 I’m big on using non-art materials for art-making, and this definitely fits the bill. 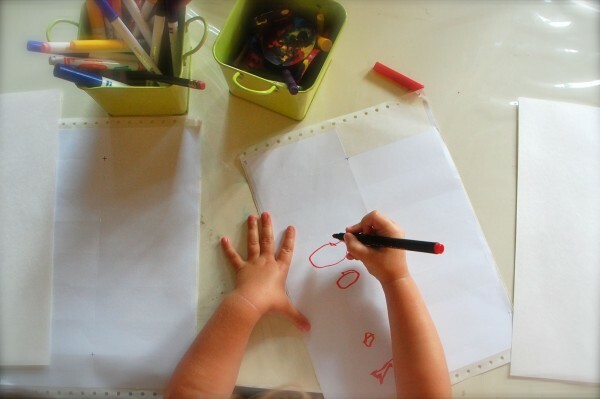 Recycling materials teaches kids that anything can be used for art, and we’re only limited by our own imaginations. 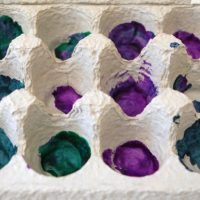 In addition to all of this, the textured, bumpy surface of the carton is a new form of tactile exploration that offers new challenges to kids used to painting on 2-D surfaces. 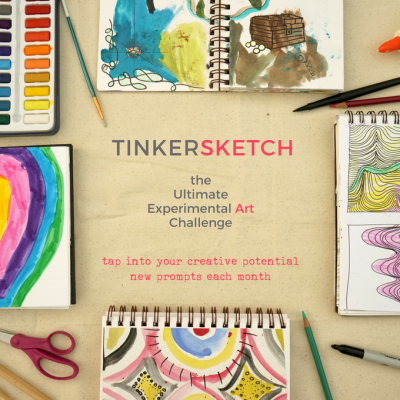 And, if you set this up on your kitchen floor, as we did, this is a flexible activity for homes with limited art-making space. 10 minutes for set-up and clean-up. 10 – 45 minutes for the activity. At 2 years old, my daughter spent about 10 minutes on this. Fat brushes. We like round, fat brushes like these. Palette or paint cups. 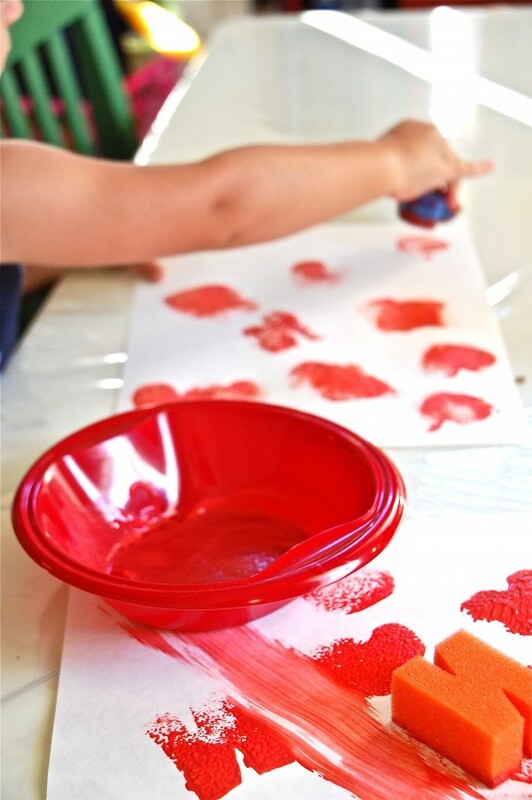 I like to squeeze paints on a plastic-coated paper plate or plate covered in foil. Save your cardboard egg cartons. We eat a lot of eggs around here, so this wasn’t too hard. Cover your work surface. I covered a large area of our kitchen floor with a paper grocery bag that I cut open. Set up materials. 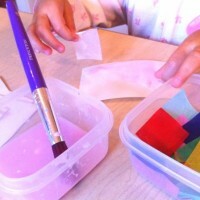 I limited our palette to two colors, which my daughter enjoyed mixing. 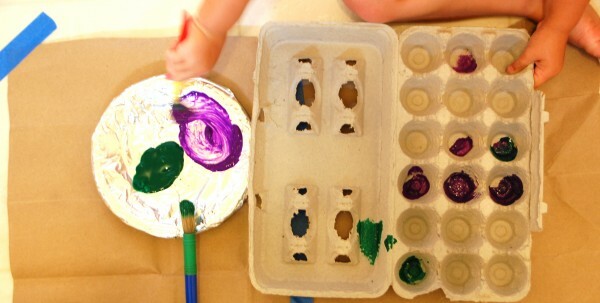 Give your child the egg carton, and see what he or she comes up with. 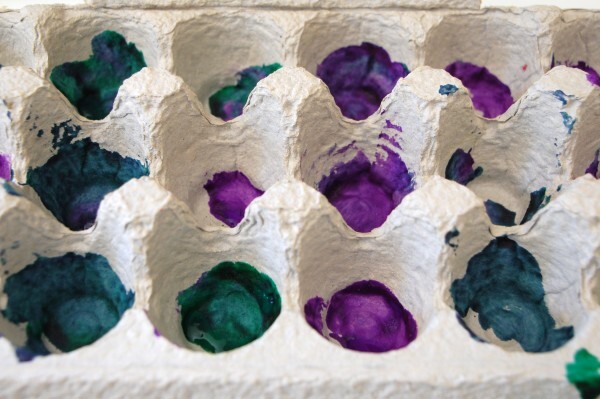 I found this very cool idea on Giggleface Studios for making an egg carton nature/object collecting box. While my daughter is probably a bit young to fully enjoy this, I imagine it would be a crowd pleaser for kids over 3. And you can see all of the photos that relate to this project here.